This takes the full-year 2018 current surplus to $34.3 billion or about 7% of GDP by our estimate. This represents a sharp narrowing from 11% of GDP in the previous two years. 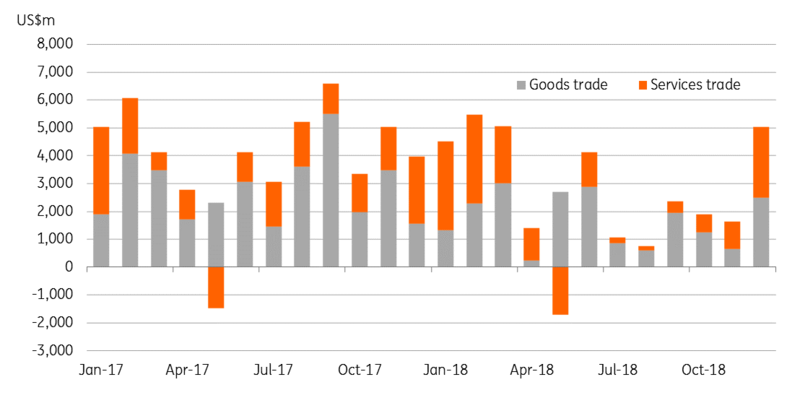 Weak global demand and an increase in trade protectionism will work to narrow the current surplus further into 2019. The commerce ministry’s projection of 8% export growth in 2019 seems optimistic (6.7% in 2018). A more reliable view by the Thai National Shippers’ Council is 5% growth, whereas we think a low single-digit figure should not be ruled out. However, domestic demand hasn’t been particularly strong either, which counters the export weakness. As such, we aren’t expecting a significant correction in the external imbalance, with the forecast of a 2019 current surplus coming in at about 5% of GDP (Bloomberg consensus 6.5%). 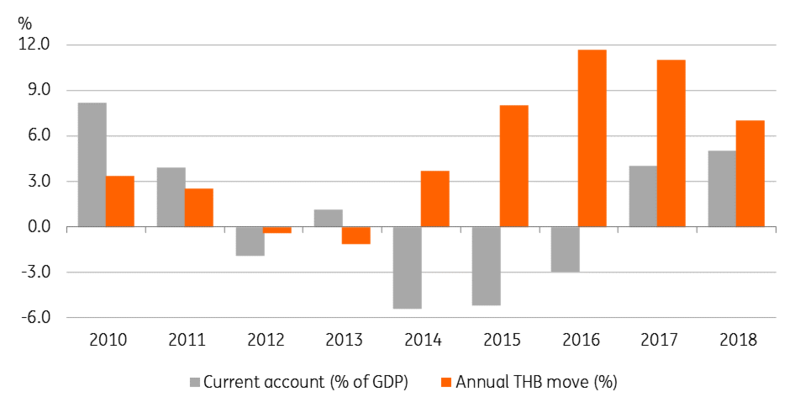 The relatively large surplus among Asian countries has been the backbone of the Thai baht's ongoing outperformance since 2017. The currency retains that spot coming into 2019. We think the authorities now have more reason to worry about sustained currency strength as export strength is faltering. The government has voiced concern against the strong currency. We expect some weakness to build in the run-up to general elections scheduled for March this year, which is what underlines our view of the USD/THB rate rising to 33 within the current quarter and lingering above this level until the political dust settles. That said, we are reviewing our forecast in view of the year-to-date performance and likelihood of a softer US dollar following a dovish turn in the Federal Reserve's policy. But the question is, will this move the Bank of Thailand (BoT) to undo the 25 basis point rate hike it implemented in December. We don’t think so, though we wouldn’t be surprised if the central bank moves in that direction later in the year. Look out for some clues from the BoT policy statement next week (6 February).